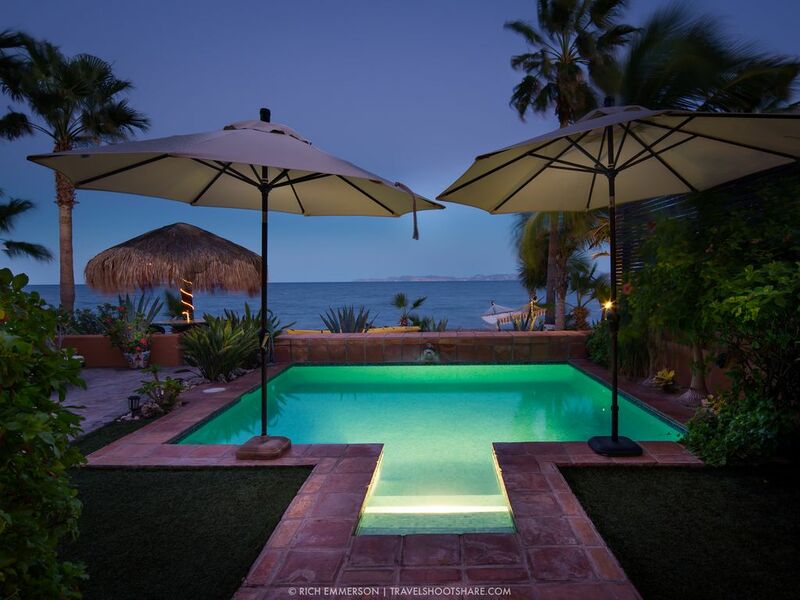 Welcome to Casa Aliciamaria, Designed and built by award winning architect Jesus Cortez, this one of a kind villa is located minutes from the center of the historic village of Loreto, directly on the beach. Construction is of the highest quality materials, custom tiles, fine wood French doors and windows.. Fine antiques and original artwork complement the interior design. The villa has been equipped with flat screen TV's, Bose Surround sound, including poolside speaker, Sirius radio, Satellite TV, and WiFi. The Casa features a courtyard entry with fountain and fireplace. Relax on the tiled veranda overlooking the beach front pool on the Sea of Cortez . The outdoor living area with gas barbeque opens up directly to the beach and island views. Enjoy cockails on the beach under our newly contructed beach Palapa. You wil find nothing in Loreto to equal this beautiful Casa's location and ammenities. This is a stand alone home providing complete privacy. 1 . One of our world class pongeros will pick you up in front of the casa and your off for a day snorkeling, or explore the sea life around Isla Coronado and picnic on the white sand beaches. Wonderful memories that will last a lifetime are included at no extra cost. Magnificant Ocean and Mountain views. Walk to village, restuarants, shops. Roof top Jacuzzi with island, water and mountain views, sunrise, sunset. Pure joy...the quiet location, the serene ocean views, the stylish home, the artwork that welcomes, the easy kitchen, close to downtown.....a happy place. As first timers to Loreto, we had few expectations, and nothing was disappointing. Well, the weather was too windy for some water activities, but plenty of other things were available in the charming town. The property is beautiful, completely appointed with everything of the highest quality. The views and presence directly on the beach are stunning. Jeanne could not be more charming, welcoming, and accommodating. As dog lovers, we were thrilled to see dogs freely running on the beach and calling the area home. It was a special birthday celebration, and everything made it perfectly so! we are so pleased with our choice in Loreto this time. the house and property were amazing, and the weather was perfect. would highly recommend this beautiful beach front home to all!! Best vacation ever!! Beautiful house and wonderful people!! This Villa is absolutely stunning and truly exceeded our expectations in every way. The owner, Jeannie, went out of her way to make sure every aspect was perfect. We would rate it ten stars if we could. Run don't walk if your thinking of renting this Villa. I have enjoyed regular visits to Loreto over 20 years for work in a local medical clinic. With a few extra days to experience the magic of Loreto Bay National Marine Park with family, we were lucky to stay in Jeanne's two bedroom villa right on the beach with sunrise views across the bay to Coronado. Jeanne met us to introduce us to the villa's features not easily duplicated in a stay at one of the local hotels. The indoor space is natural wood and tile with exceptional music selection and sound system on which to enjoy it. The kitchen is well appointed. The bedrooms have comfortable beds and linens. The outdoor space is separated from the sand beach by a low stone wall. The pool is as shown in the villa photos with comfortable lounges and hammock to enjoy the play of afternoon light and bay breeze. Loreto is a quiet town with many outdoor activities and Casa Aliciamaria is a unique home base from which to explore. Have a boat pick you up in front of the house and take you fishing or snorkleing around Coronado Island. Book a week and we will pay for your day of snokleing. We also offer shorter term renters 20 pecent off on fishing or snorkleing.